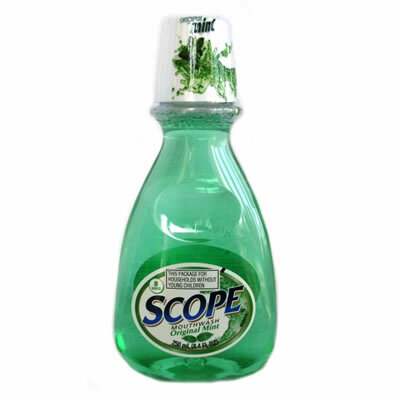 Scope Original Mint Rinse kills bad breath germs while leaving your breath feeling minty fresh. Leaves breath feeling minty fresh. Try it also in toothpaste with the whitening power of Crest. Ingredient List: Water, alcohol (15WT %), glycerin, flavor, polysorbate 80, sodium saccharin, sodium benzoate, cetylpyridinium chloride, benzoic acid, blue 1, yellow 5. Warnings: Caution: In case of accidental ingestion, seek professional assistance or contact a poison control center immediately. Do not use in children under six years of age. Supervise children over six who use Scope. Directions: Rinse or gargle for 30 seconds with one ounce of Scope.